...of the snow that is! I missed the biggest snow storm of the year so far (I was at our river place, I suppose I shouldn't complain) but I sure wish I was here to see the very first of the flakes blanketing everything...clean, bright, untouched. Johny took pictures for me, and even though this isn't what it looks like now...though we still have snow...I wanted to share these with you. We're about to have a springlike warm up, which will make many people happy. I for one, am still hoping for more big snow (I am definitely in the minority in this regard)...there are some people like Vicki Lane who wrote about changing her home decor to spin a little magic with mother nature...and many others who have had quite enough of this white stuff. I'm keeping my magical decor up to keep the snow coming...maybe we can both get our wish and I get snow and she doesn't...one can only hope. I love the snow...in Mountain Man's great photos! Hugs! There is a surprising amount of snow left here. That in spite of our sunny much warmer days. The battle of the weather talismans! I'm bringing out the big guns tomorrow! 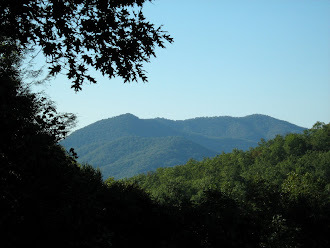 NCmountainwoman, ours is pretty much gone now, minus a few piles here and there! I think your magic is working better than mine Vicki, the snow is practically gone!